Project Pabst presents – Three Bands you must not miss! Dance Party Dream Team! This Friday night, August 26, is the opening night for another great series of concerts brought to Portland by Project Pabst! And what better way to introduce a great festival than a concert featuring three of Portland’s finest original dance bands? Join Portland Notes this Friday at The Doug Fir Lounge for an unbelievable night. The atmosphere at this venue is magical – great food, custom drinks, and professional service from door to bar – I love a concert at the Doug Fir! The bands are not to be trifled with – come prepared to dance – because you WILL be on your feet! Check out these bands – and then get your tickets before this rockin’ dance party sells out! Berahmand– is a Portland based recording artist who is quickly gaining a reputation for his high energy live shows that blend Rock & Roll, New Wave, and Soul into a cleverly fused dance sound. As an accomplished multi-instrumentalist, he purposefully self produced his debut album “Empress” on past production stylings involving dated digital devices, cassette tapes and plenty of classic analog flavor. Within moments listen, one can quickly identify an early Prince, David Bowie, Blondie , and the Rolling Stones to name a few. 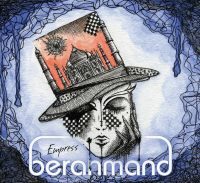 A one of a kind artist that aims to invite you in and move you; Berahmand and his band will definitely do just that! Berahmand was recently a band mentor for our White Eagle Showcase. Fantastic leader in the scene. 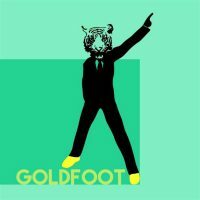 Goldfoot fuses musical elements from the past, present, and future with good vibes and dance beats. Their soon-to-be-released single, “Feel Like Dancing” embodies that fusion with a myriad of groove and a heart full of soul. It’s a fresh dose of funk that targets the booty and alleviates your non-dance symptoms. 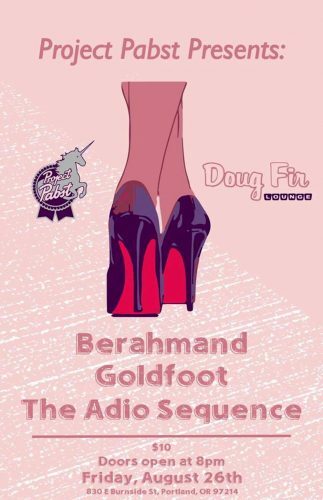 With two EPs and a high-energy live show, Goldfoot orchestrates an ever-changing dance party for their fans and fellow dancers. The Adio Sequence is an original American pop rock act from Portland, Oregon. Originally formed in 2007, the band quickly became noticed for their unique blend of musical genres. 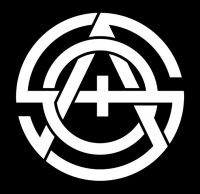 Their freshly released EP “Electric Body” pushes the group into uncharted sonic territory. With big dance beats, hybrid rock/R&B rhythms, funk guitar, and solid pop rock vocals, the band promises to do what they have always done best: get you moving.